Angela Maiers has been praised around the globe for her message YOU MATTER. She is considered one of today’s most influential thought leaders in education and transformative thinking. It is fair to say when she speaks, she leaves no room unchanged. 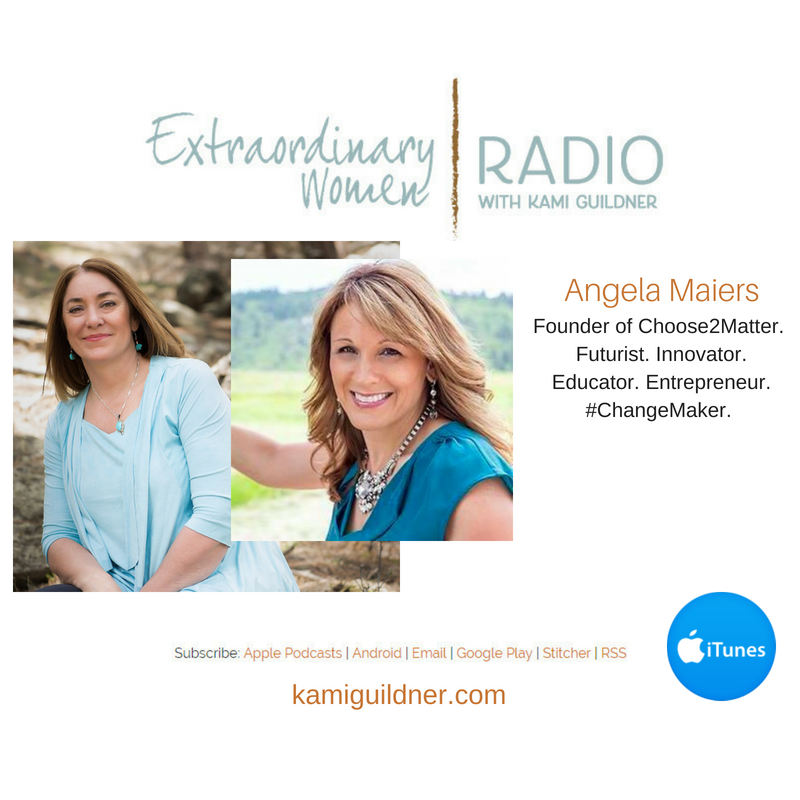 I’m thrilled to feature Angela Maiers on this episode of Extraordinary Women Radio. In our interview, Angela shares how important it that you are seen, heard and understand that you have value. Every one of us. Angela has set out to change how we teach and lead, helping others own their genius. Most recently, she has been named by Forbes as one of the Top 5 Edupreneurs to Watch; by IBM as one of the Top 20 Global Influencers, among the Top 100 Women in Technology and among the Top 20 Education Thought Leaders. She is the author of 9 books on education, including the noted Genius Matters and Classroom Habi-tudes, and was for many years a prolific contributor to the Huffington Post on innovation, technology, and education. An educator for 30 years, Angela’s work in 78,000 classrooms across 100 countries has rallied more than a million children who have banded together to launch 170 social enterprises and pass 17 laws. In 2011, she gave a TEDTalk on the power of two simple words: You Matter, and the video went viral. What resulted was the start of a movement which became the global non-profit organization, Choose2Matter. As its Founder, Angela’s mission is to help individuals recognize their value and potential contribution to change both their own lives and the world. She’s a Futurist. Innovator. Educator. Entrepreneur. Change Maker. Angela Maiers is on a mission to disrupt the status quo and to empower every individual to change their own world, if not the world around them, for the better. To learn more about Angela, visit her web sites AngelaMaiers.com and Choose2Matter.org, or follow her on Facebook or Twitter. Let’s meet Angela Maiers of Choose2Matter.